Newcastle United football club are of course known as "The Magpies", however there is a little bit of confusion as to exactly why "The Magpies" became their nickname. The most widespread belief is to do with the colours they wear, black and white, which obviously are the colours of Magpies. There is another train of thought though that suggests it is because a pair of Magpies were spotted nesting in the ground in the early days, of course though as with a lot of football nicknames the true origins are lost in the time. One more recent nickname is "The Toon" and there is absolutely no doubt as to why, its simply the local pronounciation of town. Another obvious nickname is "The Geordies", again we dont really need to explain that one do we ? 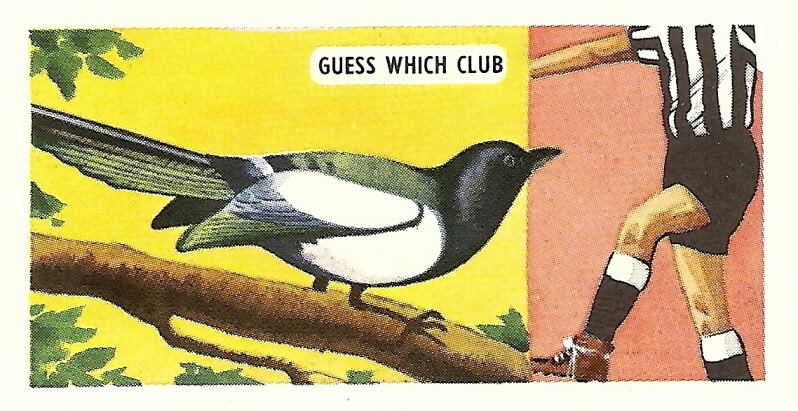 We've shown below a couple of cigarette cards that depict the football clubs nickname in caricature form. "The Magpies. The black and white shirts of Newcastle United give rise to their nickname of "Magpies". This team has one of the finest records of achievement in professional football." "Newcastle United have always favoured the Scottish type of play and have brought some of the finest professionals over the border. They are known as the "Magpies" from their black and white striped jerseys, and are also referred to as the "Geordies". For a period of about 7 years from 1904 they were the finest team in the country, in seven years they took part in five Cup Finals but were only once successful. They have, however, twice won the trophy during the past nine years, and they have also captured the championship of the League on four occasions, their last success in this competition being in 1927." Both of the cards above can be purchased on our main football memorabilia site Footybits, a link to which is at the top of this page. 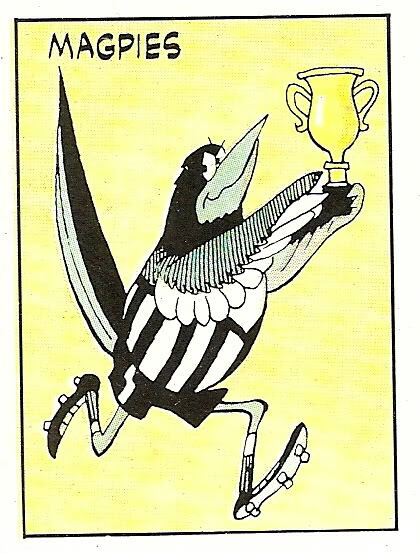 The cartoon above is Paninis take on the Newcastle football nickname, this character was part of the Panini 86 sticker series. Again, this sticker can be purchased on our Footybits site where it has been mounted in a clear fridge magnet.